Ultra Slim - 1.5mm Solid Stainless Steel Face Plate. Distinctive Modern Design. Foam gasket protects the plate. The reason we ask for your compliance is to ensure our dispatch facility which sends out thousands of parcels every week runs as efficiently as possible. 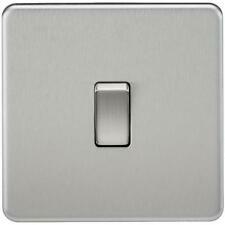 Ultra Slim - 1.5mm Solid Stainless Steel Face Plate. Distinctive Modern Design. Foam gasket protects the plate. A reason for this decision will be provided. This will identify your claim. We will ask for your instruction. 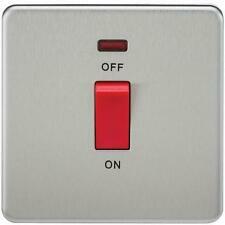 13A Switched socket. Dual USB Charging 5V DC2.1A (shared). Minimum mounting box depth 25-35mm . dependent on wiring conditions. Stylish Decorative Range with Manufacturer Guarantee. 13A rated with DP switch. 13A rated with DP switch. Made from high quality ultra slim, premium grade material. Complete with integral gasket. Compliant to all relevant British safety standards. Minimum mounting depth: 25mm. Built-in Dual USB charging solution sharing 2.1A across two ports, ideal for charging smartphones and other portable devices. Manufactured from high quality components, complete with integral gasket. Good Pricing. (#182558085455). High Quality. GRIP IT Fixings GASSORTKIT Heavy Duty Plasterboard Assorted Kit Contains 32 Pce (#182195472223). and service?. about our products.